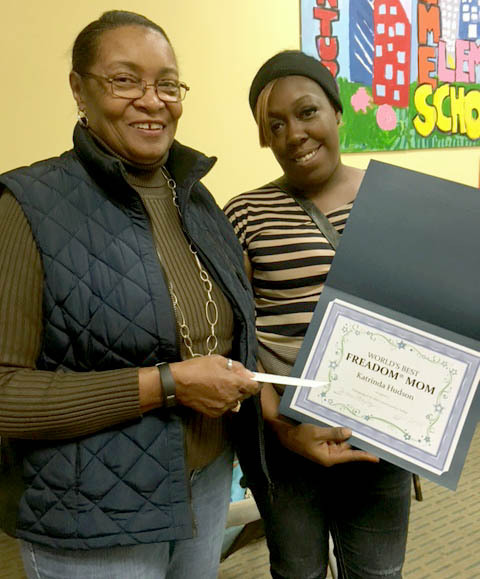 The “World’s Best Freadom® Mom” Award and gift certificate were recently awarded to Ms. Katrinda Hudson (right) by The Freadom® Road Foundation’s Ms. Brenda Dockery (left). Ms. Hudson, a Freadom® Family participant in our collaborative partnership with Family Focus Englewood, won the Award for providing extraordinary early literacy activities and resources for her two young children. She has designed and built an enticing and beautiful home library which other families of young children have sought to emulate. She has also participated in the Chicago Public Library’s Summer Learning Challenge. Ms. Hudson is a role model and inspiration.